EL PASO, Texas — Former Texas Congressman Beto O'Rourke formally launched his presidential campaign in his hometown Saturday morning, casting himself as a figure who can unite Americans of all political persuasions and vowing to build the largest grassroots campaign in American history. "Whatever our differences, where you live, who you love, to whom you pray, for whom you voted in the last election, let those differences not define us or divide us at this moment," O'Rourke told the crowd here. "Let's agree, going forward, before we are anything else, we are Americans first." O'Rourke's first of three planned Texas rallies Saturday took place blocks away from the U.S.-Mexico border, less than a half mile from the downtown El Paso street where he took the stage. 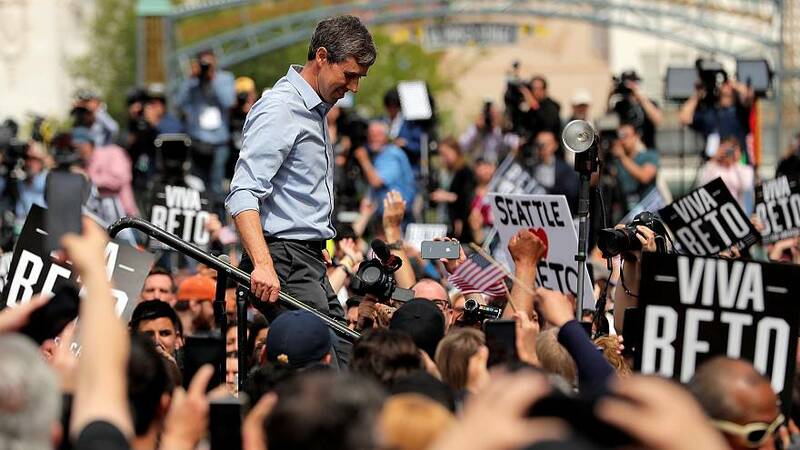 Several thousand supporters greeted O'Rourke in El Paso, and more are expected when he travels to two larger Democratic strongholds, Texas Southern University in Houston this afternoon and in downtown Austin in the evening. O'Rourke leaned heavily on how this bi-national community he grew up in has shaped him — from his years as a local city council member and his surprising win against an incumbent member more than six years ago to his time serving as the local member of the House focusing on veterans issues, immigration issues, and beyond. "It was really important for Amy and me to launch this campaign from El Paso. This is a city where I was born," O'Rourke said, adding that he was raised and is raising his family here. "Perhaps, most importantly, El Paso, to me, represents America at its very best. For more than 100 years, this community has welcomed generations of immigrants from across the Rio Grande." In an environment when immigration and the idea of a border wall have become a major flash point across American politics, O'Rourke has attempted to differentiate himself from the rest of the Democratic field by heavily identifying himself as a person from the border. Immigration was a seminal issue for O'Rourke in both his 2018 Senate campaign, and early in the presidential primary. "We are safe not despite the fact that we are a city of immigrants and asylum seekers; we are safe because we are a city of immigrants and asylum seekers," O'Rourke said. "We have learned not to fear our differences, but to respect and embrace them. We see the language is spoken in this community. The traditions, the cultures as a strength for El Paso. We understand that we are, in the words of Dr. King, caught in an inescapable network of mutuality, tied in a single garment of destiny." O'Rourke's campaign rollout began two weeks ago in Keokuk, Iowa, and immediately launched into events across the Midwest, as well as in the early primary states of New Hampshire, South Carolina and Nevada. In his campaign's first 24 hours, O'Rourke reported raising $6.1 million dollars — setting the pace for the Democratic field. His average donation was $48. The campaign's first weeks have shown both the promise and potential for this unorthodox candidate. His events at coffee shops and breweries have been packed with supportive or curious would-be voters, and his hiring this week of Jen O'Malley Dillion to manage his campaign signaled a desire to professionalize his skeletal operation. But O'Rourke faces a wide swath of new challenges in a Democratic presidential primary that he didn't face in his much-publicized Senate race last year against Republican Ted Cruz. He enters a very crowded field with other Democratic stars from across the country in a year when hunger is high among many Democrats for a ticket including gender and racial diversity. O'Rourke's focus on his border community resonated with Giselle Rodriguez of El Paso, who attended the rally and thinks O'Rourke "is ready to be president, especially because he has personal experience in El Paso and because very involved in the border," she said. "It's a safe place ... I cross to Juarez whenever I want. I never have an issue. I never see a problem."